All these tools have in common to be lightweight (single executable). If you know other useful and lightweight apps, let me know and I’ll add them in GPU-Toolkit. 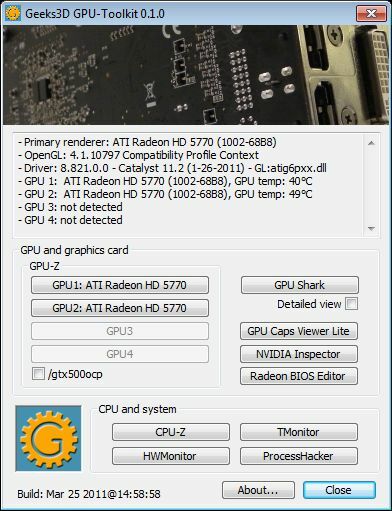 Remark: There are four buttons for GPU-Z because I took advantage of the new /card command parameter, introduced in GPU-Z 0.5.2, to start GPU-Z on a specific GPU. having all these tools in one exe makes things so much easier..
is there a reason why, occasionally, when hitting a button, it says it cannot start..
everything, except nvinspector opened first time around..closed them all down..then nvinspector would load..closed it..fired up gpushark and got the message cannot start..opened GPU-Z..closed it..went back to GPU-Shark and it loaded fine..
Well, that is one neat little tool box. I am some what new to computer building and fixing but even I could use it and with out any trouble. Found out lots of Info that I did not know. Will look at this problem.